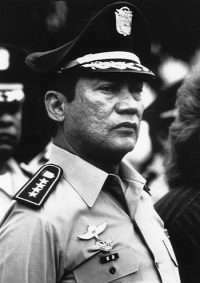 Beginning in the middle of the 1980s, relations between General Manuel Noriega, Panama’s de facto leader, and the United States started to deteriorate. In 1986 President Ronald Reagan pressured him with several drug-related indictments in U.S. courts; however, Noriega did not give in. As relations continued to spiral downward, Noriega shifted his allegiance towards the Soviet bloc, soliciting and receiving military aid from Cuba, Nicaragua, and Libya. In May 1989, an alliance of opposition parties counted results from the Panamanian national elections, which showed their candidate, Guillermo Endara, defeating pro-Noriega Carlos Duque by nearly 3-to-1. Endara was beaten up by Noriega supporters the next day while Noriega declared the election null and void. On December 15, the Panamanian general assembly passed a resolution declaring that U.S. actions had caused a state of war to exist with Panama. Then on December 16, four U.S. military personnel were stopped at a roadblock outside Panamanian Defense Forces (PDF) headquarters; the PDF opened fire as they attempted to flee an angry mob. One soldier, Lt. Paz, was fatally wounded. President Bush ordered the invasion of Panama, to commence at 0100 on December 20. Noriega took refuge in the Papal Nunciatura, the Vatican’s embassy. The U.S. military then famously played rock music day and night for three weeks until he finally gave up on January 3, 1990. 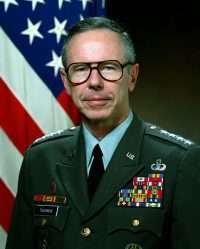 John A. Bushnell was Chargé d’Affaires in Panama from 1989 until 1992. An assignment to the National Security Council was followed by tours as Deputy Chief of Mission at Buenos Aires, Panama and subsequently as Assistant Secretary of State for Inter-American Affairs. In Part I, Bushnell discusses the planning of the invasion, Noriega’s infiltration of SOUTHCOM, money laundering, the embassy’s active support for the opposition, and how Secretary of State James Baker acted as his personal desk officer. You can read other excerpts in the Panama Country Reader and read Part II here. You can also read about the negotiations for the Panama Canal Treaty and about the years preceding the U.S. invasion. For a comparison, take a look at the 1983 invasion of Grenada. BUSHNELL: [In September 1989] when [USSOUTHCOM Commander-in-Chief General Maxwell] Thurman and I had discussed the then evolving ops plan in Washington, I had raised the problem of capturing Noriega. Certainly capturing Noriega for trial in the U.S. was one of the important U.S. objectives. Moreover, until he was captured, the Guard and the digbats [Dignity Battalions, paramilitary groups set up by Noriega to defend Panama from the U.S.] were likely to keep fighting and trying to capture Americans or destroy bases or the canal. Getting Noriega had been at the center of the earlier ops plan. These plans seemed to assume we would know where Noriega was or could find out quickly. Since the new ops plan called for many simultaneous attacks, it was important that one of these be where Noriega was and that there be a plan to capture him. Thurman agreed. But how would we know 48 hours in advance when the plan was put in motion where Noriega would be two days later? Even if we could fine-tune the operation close to the launch, how would we then know where he was? The Cubans responsible for Noriega’s security were very professional; they maintained radio silence; they ran many false convoys that looked like Noriega moving. Noriega slept in many different places. Our intelligence on Noriega was not as good as one might have thought given our large intelligence resources in Panama. Thurman said his staff would work the problem. He said, “We will go to all the places he might be.” When I got to Panama, Thurman told me they were working on a list of the places that Noriega frequented. Each of these would be attacked at the launch hour. Troops would be trained to capture him, not kill him. I worked on this planning. A list finally totaling about 28 sites was developed. Some of these such as his command centers and base military clubs were to be attacked in the existing plan; for these a dedicated small squad was assigned to find and capture Noriega. Other places on the list, such as his homes, the homes of his favorite mistresses and mother, certain recreation and eating facilities, were not well defended, but each presented its own problems for the small attacking group assigned. As intelligence worked hard at following Noriega’s movements, it was estimated that he spent over 97 percent of his time at these 28 sites or moving among them. Special Forces were assigned to most sites because Noriega’s Cuban directed personal security was very good and very deadly. I asked how our shooters were going to capture Noriega, particularly if he actively shot back, without killing him. Thurman and his staff said this was a difficult problem; troops are trained to kill from a distance to minimize their own losses. Special training and equipment would be needed. Then, to my amazement, the military proceeded to build replicas of the sites Noriega frequented on Eglin Air Base in Florida. The squads assigned to each site studied them and developed plans to go in, take out the opposition, and capture Noriega. It was a mammoth operation to figure out what each site looked like both inside and out, to build the replica, and then to practice the attack. In November there was an exercise at Eglin in which all sites were attacked at once. 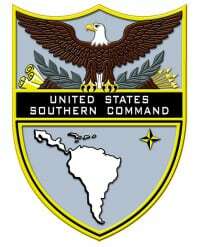 SOUTHCOM invited me to go to Florida for that night, but I was not comfortable leaving Panama even for just 24 hours. I would have had to get special clearance from Washington and named one of my counselors chargé; my travel might have called attention to our planning. Nobody else in the embassy knew anything about the ops plan, and I later learned no one in State knew about the Noriega part of the plan. Only a handful of officers in SOUTHCOM knew about the whole ops plan, and many of them thought it was too grandiose ever to be executed. Various units knew their assignments under the plan, but so much of the operation was to be carried out by forces from the States that few of the military in Panama needed to know the general plan. From our first meeting in Panama I stressed the danger that the plans would be acquired by Noriega’s superior intelligence penetration of SOUTHCOM. At first Thurman did not believe his operations were infiltrated. I bet him that any paper created in his command that seemed interesting would reach Noriega. We ran some tests. In one test the document went to only five officers. Later our intelligence reports indicated Noriega got either a copy or the substance. Thurman was then convinced that his intelligence and perhaps communications and other larger organization were infiltrated, but he had confidence in his general staff. Now, to go back, you asked about my instructions. It was clear from all the policymakers I had talked with in Washington that the objective was to get Noriega out so we had at least a chance of stopping the drug and money laundering business and a chance to work with a friendly democratic government on canal issues. Everyone’s gut reaction was that we should increase diplomatic isolation and tighten the economic sanctions to force economic decline. Although I worked in these directions, I also reported that we were about to lose ground. Several countries were about to bring back their ambassadors, and our efforts to get the OAS to authorize tougher steps was getting nowhere. Noriega seemed to be able to get increased amounts of drug money and, more important, borrow from the banks in Panama to slow or even halt the decline in the economy. Thus our measures were not likely to do the job. We could hope and pray that there would be another coup from within the Guard. I had even been approached very gingerly about such a coup, but Noriega was very brutal with any opposition, and his good intelligence was not likely to fail him again as it had in October. Moreover, the Cubans were playing a greater role in supporting and protecting Noriega. The only plan I knew of that would end the Noriega regime was the one General Thurman had developed. I was concerned that Noriega was getting more sure of himself while at the same time he seemed to be more in the hands of the various mystics to whom he gave great credibility. The existence of the democratic opposition and the civic groups that would bang their pots and pans was more than a minor annoyance to him. He was trying to clamp down on the opposition. Digbats would confiscate the banging pots, for example, and several opposition activists were imprisoned. I was concerned that Noriega would decide to get rid of one, or all three, of the presidential and vice-presidential candidates, who had really won the election. We had arranged for personal bodyguards and for limited security training for their security details, and we provided communications equipment. But these men lived in Panama; in the final analysis they were at Noriega’s mercy. Also once I was in Panama, I began to understand that the digbats were a bigger problem than anyone in Washington seemed to realize. There were a lot of them, although we did not know how many. Intelligence placed 600 on the payroll of the electric company alone; several other state enterprises and even a couple of ministries had substantial numbers. Moreover, there seemed to be others, perhaps some part-timers, who were completely outside the government framework and paid from the drug money, and the number was growing as Noriega hired digbats as a way of limiting unemployment in the two main cities. We began to get reports of Guard officers, and even Cubans, training the digbats and providing them heavier weapons, even rocket launchers. I discussed the digbats with Thurman and his staff several times. Their reaction was that digbats were not their problem as they were not organized as military units and had no bases. The digbats lived at home, mainly in the slums, and came together only for training, pro or anti Noriega rallies, and other political events. It was not possible for the US Army to operate against them, and it was not necessary as they were not a threat to our military which had much greater fire power. “How would we distinguish digbats from other civilians or from teenagers acting macho?” Thus digbats were an unresolved and worsening problem. As you can imagine, my schedule in Panama was to work about 16 hours a day seven days a week because we had so much going on. Thus far I have not even mentioned our parade of visitors, and I don’t mean the Special Forces and other military units.. .. In late November I had a personal experience that gave me a great story to bring the money laundering problem home to visiting groups, because often a little story had the greatest lasting impact as well as lightening a somewhat dry briefing. I was at a dinner party one night with lots of Panamanians, most but probably not all opposed to Noriega. I was seated next to a woman who was the wife of one of the businessmen or lawyers, just making small talk. She apologized for being very tired. I asked why. Well, she didn’t get any sleep the night before. Why didn’t she get any sleep? Because she was the supervising teller in a bank and supervised a bunch of tellers who counted money. She said, “I only have to do it maybe twice a month. I’ve got two assistants who generally supervise, but sometimes they can’t do it, so then I have to do it.” I asked which bank she worked for; it was a large non-US international bank. Q: That’s a lot of money. BUSHNELL: Right, and it’s not one-dollar bills. It gives you an idea of the extent of the drug money laundering in Panama. If you look at the data, Panama was shipping U.S. currency to the Federal Reserve at the rate of something like 75 to 100 million dollars a month…. Although the embassy, and I mean all agencies, had few staff, we had a lot of activities directed against Noriega. 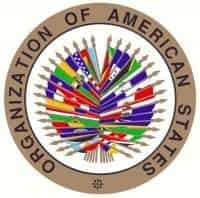 John Maisto had approved an expansion of the usual USIS [U.S. Information Service] mailing of current US foreign affairs information material to include some articles in Spanish by Panamanian human rights activists. Noriega had long since shut down or taken over any opposition newspaper or broadcast organization…. I knew Noriega would see such an embassy publication as a hostile act, but my instructions were to support the opposition so I agreed while making sure Washington was aware of what we were doing. I heard that many career officers in USIA thought the even-handed reputation of the agency was being put in danger, but the NSC deputies endorsed the idea, and USIA even had to send additional funds to support the publication and mailing. Some weeks the publication was pretty explosive in its negative information and cartoons on Noriega, and a couple of times I asked to have it toned down some. Our publication became the de facto opposition newspaper with articles by one of the elected but pending leaders in almost every issue. Our mailing list grew rapidly with inputs from opposition friends. I soon found that everyone I talked with was reading it. Intelligence indicated that copies somehow were getting to many people in the Noriega government and the Guard…. We did other things to give encouragement to the local opposition, who were really risking their lives and in a couple of cases losing their lives in opposing Noriega. 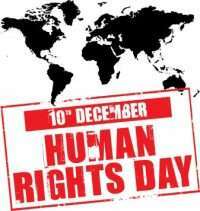 For example, I gave a big reception on UN human rights day [December 10] in early December. It’s not unusual for an ambassador to give such a reception, but in this tense confrontational situation it provided a special occasion for human rights leaders, the civic opposition, and the elected but pending leaders to get together under a friendly roof. Most came despite the fact that Noriega’s operatives were outside the residence grounds taking pictures of everybody coming in and leaving. For me such a reception required only a few hours and a little speech, but others in the small embassy had a lot of work to put it together and get invitations out…. One of the problems was how we were going to rescue that guy if anything happened. At Thanksgiving time one of the embassy’s local employees who handled the mail was picked up, apparently by Noriega’s secret police, tortured for the whole day, cursed out because he cooperated with the Americans. He wasn’t permanently physically damaged, but the incident worried our local employees a great deal. Some began sending family members to the States. I was, of course, regularly followed everywhere I went. Any phone that I would be likely to use was tapped, including all the phones in the embassy. There was a post of Noriega’s intelligence set up across the street from the embassy so it could watch every move we made day and night…. Q: I guess it was December 16th that the Panamanian Assembly urged by Noriega declared that a state of war existed between Panama and the United States? BUSHNELL: It was on Friday the 15th that the Assembly passed a resolution declaring the country in a state of war and adopting emergency measures. The resolution established a new position as head of government and named Noriega to it as the maximum leader of the struggle for national liberation. He was given many special powers in effect endorsing his role as dictator. The resolution stated that irresponsible actions by the government in Washington had impoverished all the people, closed off job sources, made access to consumer goods more difficult, and decreased the flow of tourists. Initially I thought that this resolution was just public relations, placing the blame for the lasting poor economic situation on Washington and confirming Noriega’s dictatorial powers. However, I was soon informed of a speech Noriega gave at about the same time in which he said among other threats the Canal would run red with the blood of Americans. When I talked with General Thurman (at left) that evening, I asked what unusual military actions the Guard was taking. He said the Guard had moved to a higher level of alert and he was inclined to match them; I agreed. Statements by Secretary Baker and other officials in the U.S. had been strong but had not had blood flowing. Noriega had also referred to taking over the Canal soon…. I reluctantly and against the wishes of my security people had agreed that the big annual dinner/dance/party of the American community in Panama could be at the residence that Saturday night. This annual dinner was a fund-raiser for various local charities supported by the American community. Often it was held on one of the bases, but the frequent tight security on the bases ruled out that locale. The American organizers, leaders of the community, were particularly eager this year to have it at the residence because they were concerned that, if it were in a less secure location, contributors would stay away in fear of disruption by the digbats. Much as I wanted Americans to leave Panama to reduce the potential for American hostages, I also felt an obligation as a leader of the American community…. The rest of the evening was schizophrenic as I tried to join the festive occasion between phone calls with SOUTHCOM…. It was confirmed that Marine Lt. Paz had been killed by the Guard – by the Machos del Monte who Noriega kept guarding his headquarters after the Giroldi incident. Just what Marine officers were doing in the area of the headquarters, which was off-limited to U.S. military, was not clear, but Thurman said they were not on duty…. Four Marine officers in an old Chevy Impala got lost on leaving the restaurant and drove not only into the off-limits area but directly toward Noriega’s headquarters. The Machos del Monte had blocked the streets adjacent to the headquarters as part of their security for Loyalty Day. Moreover, they had been celebrating Loyalty Day with many loyalty drinks. Later I learned Noriega had intelligence that a coup was planned against him for that day, and this intelligence was probably the main reason for intensified security and edgy troop nerves…. 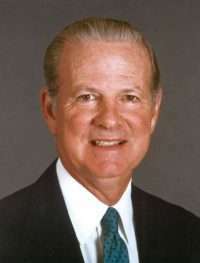 Q: On Sunday about 5:30 in the afternoon you got a call from Jim Baker. BUSHNELL: I spent the afternoon in the embassy working on my plan to deny Panama banks which laundered drug money access to wire transfers. I needed something to keep my mind off the discussions I imagined were going on in Washington and the potential results any decision would have in Panama. I got a call from Secretary Baker on the secure line. He said, “John, you seem to know more about all the military planning than anybody in the State Department does, than I do, but the President has agreed to launch something called Blue Spoon late Tuesday night. He said, “There are going to be a lot of things you’re going to have to deal with, so I’m your desk officer. You can’t talk to anybody else about this. Anything you need, anything you want done, call me anytime. Thurman knows about this obviously, and there’ll be a few others who will know the thing’s set, but very few people will know that it’s a go.” That night I got together with Thurman, just the two of us, to make the necessary plans…. Q: You were talking to Endara himself at that point? BUSHNELL: Yes, I talked with him at least briefly a couple times a week, sometimes with the Congressional visitors, sometimes at social occasions; several times I met privately with him. I also saw the two VPs frequently. I consciously tried to give them moral support and to do the few things I could to improve their physical security such as access to a house on a military base and improved communications. However, although Secretary Baker had implied that I could tell them about Blue Spoon, I didn’t feel I could before Tuesday night because there was too much danger something they would say or do would unintentionally tip off Noriega, who had them watched like a hawk. Even a big improvement in their spirits might be a warning sign to Noriega. Secrecy and surprise were absolutely essential to the success of Blue Spoon; many American lives could be lost if Noriega and his forces were prepared for our troops’ arrival. Thus I was in the awkward position of making all the preparations for Endara and company to assume the government without telling them. On Monday I sent messages to each of the three inviting them to have dinner with me across the canal at Howard Air Force Base on Tuesday evening. I told the junior political officers who delivered the messages to tell them it was a very important visit. I hoped everybody’s assumption, including the officers in the political section, would be that we were going to have a visitor, perhaps the Deputy Secretary or even the Secretary of State, who was on his way someplace and was going to stop and have dinner with the elected but denied leaders. I didn’t say that, but I sort of led them to believe it…. The Secretary had given me his personal secure numbers on Sunday. Of course, we couldn’t communicate in writing as many additional people in the communications channels would have found out about the operation. As I recall, we had two discussions on Monday. I told him how I was handling the new leadership, that they would be sworn into office by midnight Tuesday, that a radio station would start broadcasting their messages to their people by 1:00 a.m. I asked him how we were going to deal with the international legal aspects and the legal authority for the operation. He said, “Oh, damn it, I’ll have to get the legal precedents. I can’t get the lawyers involved yet. I’ll work on it.” Later he told me he found a way to get the lawyers involved without telling them what country. I didn’t have much that I needed him to do, although it was rather nice to have the Secretary of State as a desk officer, rather comforting…. I also had to deal with the embassy situation. I double checked with Thurman that the reaction battalion would be available to protect the embassy if needed. He said it would, although the availability of helicopters might be limited; as the drive to the embassy was short and there would be no traffic after the operation started, reinforcement did not appear to be a problem. About half of the American staff had already departed to spend part of the holidays with their families. There was nothing I could do to improve the security of those remaining without risking a leak on the operation. Moreover, it was not clear that our employees would be safer on a base than scattered in their individual apartments, since any counterattack by Noriega forces was likely to be against the bases…. At some point in the afternoon Secretary Baker called and I told him Noriega had gone to the house of a mistress in the city of Colon. I said that, if he follows the usual pattern, he will be there when we arrest him at 12:40 a.m. The Secretary asked what security the house had. I said that, if I remembered right, the back of the house actually extends out over the bay. There would be a few sleepy guards in front. The Navy SEALs would come in from the bay, up underneath the house; some would take care of the security while the others captured Noriega. I commented that we were in luck because Noriega could have been in his headquarters or other military installation where he might well have led a strong defense. The Secretary commented that we needed a lot of luck over the next 24 hours…. 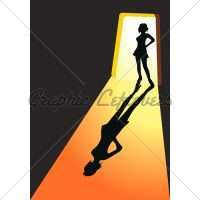 « Women in the Foreign Service – You’ve Come a Long Way, Baby!